As their scientific name suggests, bat rays live along the waters of the west coast of the United States at depths of up to 165 feet (50 meters). While the babies look like tiny ravioli, bat rays can get to about 6 feet (1.8 meters) in length and weigh 210 lb (95 kg) once they’re fully grown. At the Monterey Bay Aquarium, caretakers give baby bats—or “pups”—fresh chunks of fish to eat. The baby bats are able to use their plate-like teeth to chow down on fish chunks, which, as a video the aquarium recently posted to YouTube shows, is even cuter than you think. 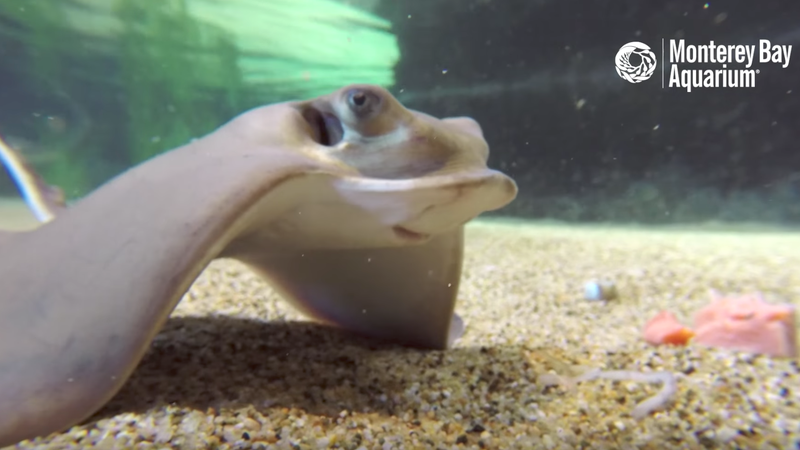 Bat rays can sting, just not with the same force as some of their relatives can. According to Aquarium of the Pacific, “While the sting of a bat ray is painful, it is not usually serious.” They’re doing their best and that’s all that matters.